Benjamin Levy was the first Jewish American to be cited for and later receive the Congressional Medal of Honor. Levy was a young drummer boy during the battle of Frayser's Farm, June 30, 1862. Levy, acted with extraordinary heroism and coolness, retrieving his fallen regimental colors, helping stabilize the battle line and saving his regiment from disaster. The marker, erected by JASHP, is located near the intersection of Darbytown Rd. and Long Bridge Rd outside of Glendale, Virginia. Benjamin B.Levy, a young Jewish volunteer, received the Medal of Honor on 1 Mar. 1865, one of the first Jews so recognized. He entered service in the 1st New York Infantry in New York City on 22 Apr. 1861. During the Battle of Glendale (Frayser's Farm) on 30 June 1862, under heavy fire near here, Levy "took the gun of a sick comrade, went into the fight. and when the color bearers were shot down, carried the colors and saved them from capture." 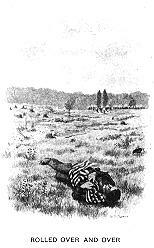 He later reenlisted in the 40th New York Infantry and was wounded at the Battle of the Wilderness in May. 1864. He rolled over and over to save the flag.